A varied selection of mirrors and mirrored accessories to engage children in concentrated, reflective play. 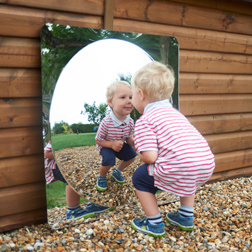 Mirror Exploratories are ideal for investigating natural or man-made objects from several angles and can be used effectively in pairs or small groups to encourage discussion, sharing and taking turns. Decorative mirrors such as the Hexagonal or Jigsaw Softies can be used to enhance a reading corner or quiet area, and the Message Mirrors are for specific purposes and themes around the setting or classroom, including “Wash Hands” and “Today’s Special Person”. Our Domed Acrylic mirrors provide a fun, interesting and distorted view on the world. All of our mirrors are made from safe acrylic plastic so are tough but lightweight and ideal for use with children.